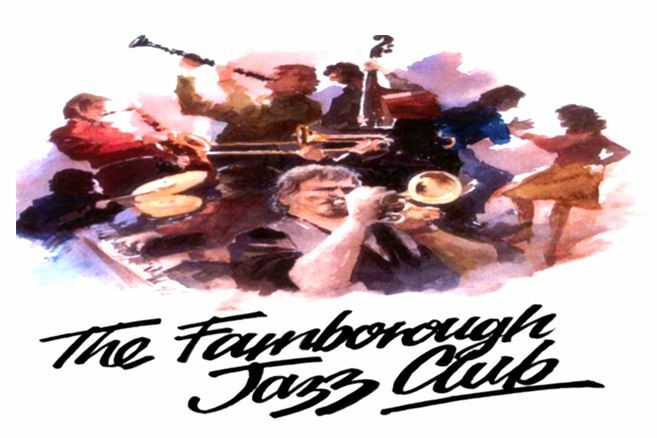 Brian Carrick’s Algiers Stompers, who come from the Newcastle area, had their first visit last Friday, 26th October 2012 here at Farnborough Jazz Club in Kent. Brian plays clarinet, tenor sax and vocals, with Peter Wright on trumpet. Chas Hudson was to have been on trombone, but unfortunately went to Farnborough in Hampshire, even though I did warn we are in Kent – still Chas, you are not the first and probably not the last to do so. Plus Chas, you probably enjoyed the drive through Hampshire’s pretty scenery and the pub you no doubt visited aye? Roy Mascal played trombone in your place and who had only to travel from Welling. Gabriele Gad was on piano, with Stu Morrison on banjo, Andrew Hall on drums and Bill Cole on double bass. (See our separate band ‘Page’ for their CV’s). You know, we all experience bad problems at one time or another, but what about this band! First of all, band leader Brian had a very serious accident when returning home from a gig back in 1998. He was very seriously injured and spent years in/out hospital. He is now a bionic man! But what about his face! Oh it is such a smiley one. I am sure he moans in private moments, but it doesn’t show, the lines on his face are smiley ones. Brian plays both clarinet and tenor sax spectacularly. Then I come to Andrew! I did mention in the separate band ‘Page’ how he had been living in New Orleans and had lost everything in Hurricane ‘Katrina’, so has returned to live back here. Likewise to Brian, you would not have seen any hint of all this in his face either – plenty of smiles. Playing jazz (or any music) ‘live’ has to be the most wonderfully therapeutic medicine there is. I also gain the same pleasure from listening and dancing too. So if you are feeling ‘down’, get yourself to any jazz club – preferably ours and you will feel a million dollars in no time, if only to set yourself up for another difficult week. Last Friday, everyone enjoyed themselves so much, both band and audience. The band’s excellent choice of repertoire was quite refreshing, with such numbers as ‘Hanauma Bay’, a song Gabby wrote, composed and sang herself and what a gorgeously deep and beautiful voice she has too. Well done Gabby. Other numbers I jotted down were ‘Can I Say Exactly How I Feel’, Louisian-I-A’, plus Hank Williams’ number ‘Take These Chains From My Heart’. Stu (ex Chris Barber’s Band) played a brilliant banjo piece in ‘Oreo Biscuit Cookie Blues’. Then Frank Sinatra’s number followed called ‘Black Cat On The Fence’. Another fantastically played number was ‘Bring It On Home To Grandma’. Gabby then sang ‘Heebie Jeebies’. Also Brian gave a brilliant clarinet performance to ‘Burgundie Street Blues’. He proudly explained his clarinet had belonged to George Lewis, which was presented to him by George’s daughter Shirley. I’m sure that had something to do with how he played it (lovingly) – great vocals too. As with all clubs, we can always do with some more support. So why don’t you come and find out for yourselves and join us – dancing is good for the soul, plus losing weight too. Whilst I’m on the subject of weight, have you enjoyed watching ‘Strictly Come Dancing’? I have to say we do enjoy the programme – Keith certainly enjoyed little Ola Jordan’s hot pants last weekend! However, I wished someone at the BBC could ask the band and/or the programme presenters, what is wrong with using the correct music for the VARIOUS dances? It is so soul-destroying to see the ‘Star’ dancers struggling to dance to ‘pop’. Don’t they see the standing ovations mainly happen when the music is RIGHT! The American smooth, the Tango, the Charleston and the Paso Doble are prime examples, they all have differing beats. Another point for the BBC to ask is if their audience could be informed before coming ‘on air’, how to clap to the ‘off beat’. Don’t get me wrong, as a dancer (amateur I may be), years ago, I always clapped ‘on the beat’ until I was shown by a band leader (Jeff of Manhattan Jazz Band) how I was wrong and I soon cottoned on. I now know it is very irritating to musicians. Some of our own audience get it wrong, but we are not ‘on air’! Here’s the best of ‘jazz’ to you all. This entry was posted in Brian Carrick's Algiers Stompers on October 28, 2012 by Diane.